Register Log In Britbike forum Forums Bsa bulletin board how did this happen? Still here since 1996 serving BritBikers, just sayin..
1,555,560 Calling all Dash Y and Y bike owners..
71 registered members (AML), 469 guests, and 235 spiders. so i finally got myself together and decided to get rid of those oil spots on the floor, pulled the timing side apart, need new kick seal and a fresh coat of loctite 518 on the flange no problem. then time for the drive side.. noticed a high amount of metal shavings in the oil. 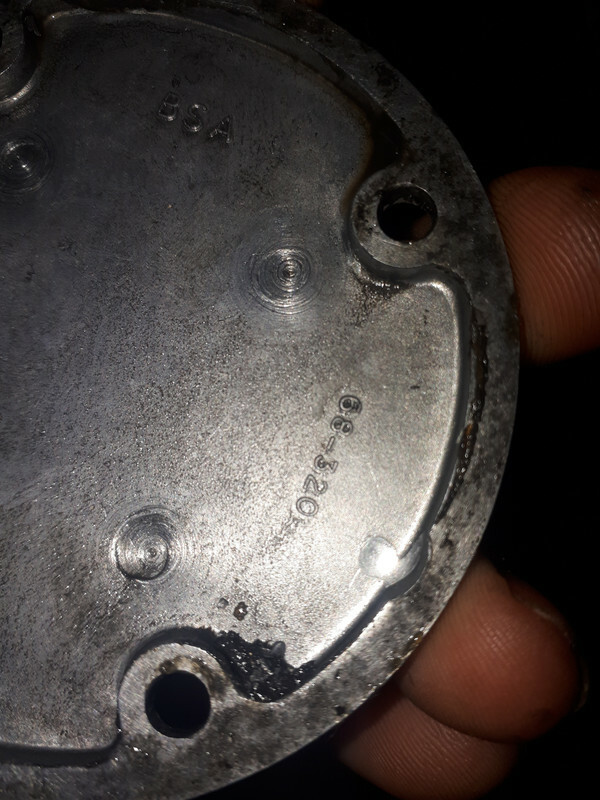 well did not think much of it as i renewd the clutch plates like 1000km ago.. then , after removing the chaincase cover i noticed it was aluminium shavings... hmm chain is steel , clutch is steel , bearings are steel... but after a quick look at the rotor i saw where they came from ..
the rotor had scraped against the timing pin on the cover. how is this possible? 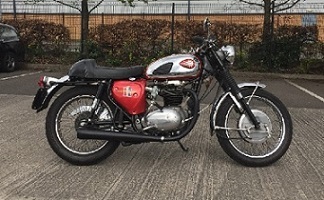 its a BSA B40WD 1967.
rotor nut was on tight and tab washer intact. 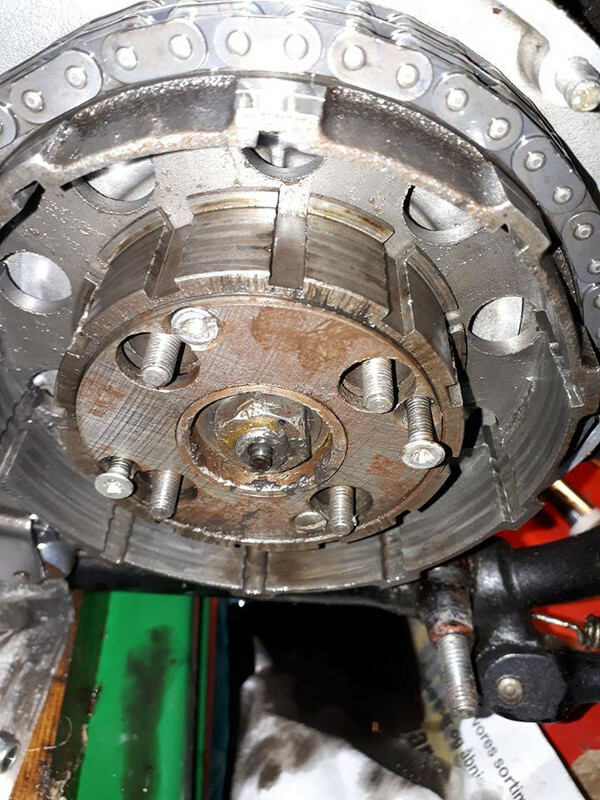 when i did the clutch 1000km ago there was no problem and have not messed with the rotor during or since doing the clutch. 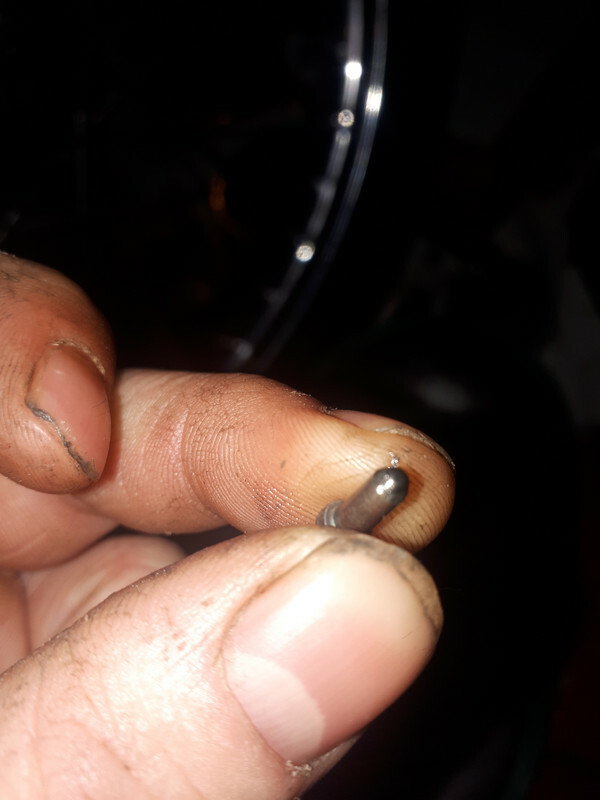 timing pin was in its correct place, tho quite a bit rounder than it use to. did also notice tho that the rotor was sticking out a little bit from the stator, but might always have done this. 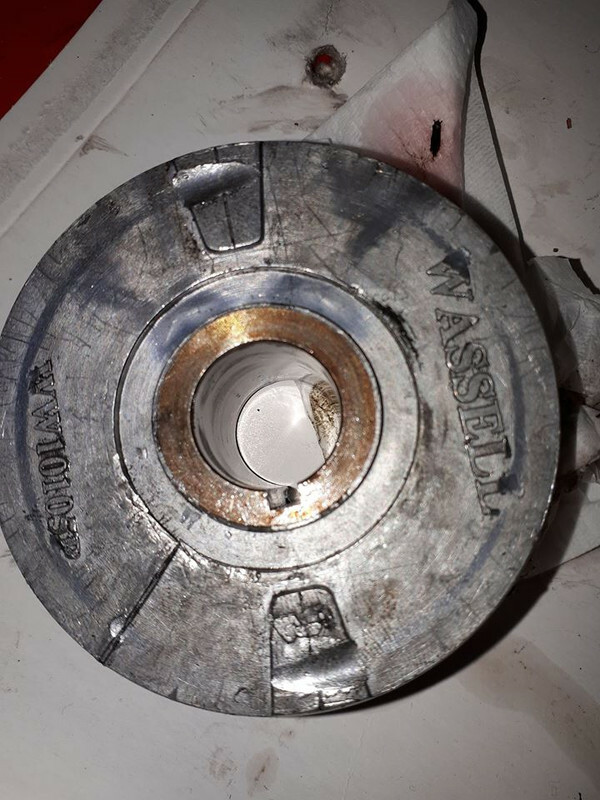 Check the thickness of the Wassell rotor and compare it to the old one, I bet its thicker and so touched the pointer on the timing cover. Other possibilities along with the rotor mentioned . ... I think up to 0.7 or 0.8mm between thinnest and thickest . Or a new / different duplex sprocket ? ... Or did you linish the gasket faces ...or not use a gasket . have not changed the rotor. have not messed with the distance piece, tho i noticed there is an aditional washer ´/ shim behind the sprocket. but it has always been there without troubble. did use a gasket, hylomar on the cover and grease on the case. the clutch is actualy quite smooth taking the basket condition in to account. but yes it is quite badly notched. How's the primary chain alignment? That will indicate if the sprocket is in the right place. did not check before i took it apart.. did notice quite some wobble in the chainwheel. read in my rupert ratio that you can take a bit of the spider to counter this, any one have experience with this method ? On the A65s I've owned, and also on a TR5T that I happen to be working on, the face of the rotor is recessed from the stator by, I would say, about 1/8 inch. '65(lower)/'66(upper, wheels, front end, controls)/'67(seat, exhaust, fuel tank, headlamp)/'70(frame) A65 Bitsa. I had to shorten the timing pin on my A65 after fitting a new rotor. I think K has it right, its possibly been rubbing for ages and you just didnt notice. did notice quite some wobble in the chainwheel. 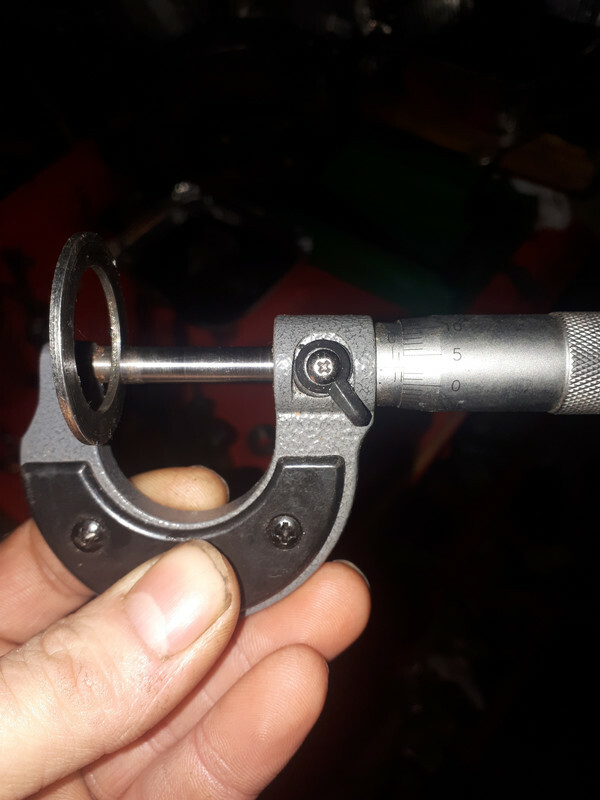 Yes it does work, mount in a lathe and skim a few thou off or if no lathe flatten the end on plate glass and emery cloth. A few thou at the centre creates a lot of movement at the outer edge. ive tried that dodge on my A65, years ago, you loose a little wobble, but it doesnt make up for the internal wear on the cush spider and end plates , that can still tilt and cause drag/slip, The spider centre protruding a bit is just the tip of the wear iceberg. Looking again at the rotor pic, the rub marks are too wide to be the timing pin, that cuts a neat narrow groove, maybe it got bent over? possibly one of the cover plate screws is too long and saying hello to the rotor, or something else got jammed in there , broken chain roller maybe? Last edited by gavin eisler; 02/04/19 1:19 am. Good point, those gouges are wide. This being a '67, I guess it would have an inspection cover over the rotor. Inspection cover mounting screw too long is a good guess. Or, if the rotor is the wrong one, or if it is spaced out too far on the crank, then I suppose the inspection cover screw bosses could hit. Hmm, four-bolt clutch on a '67? 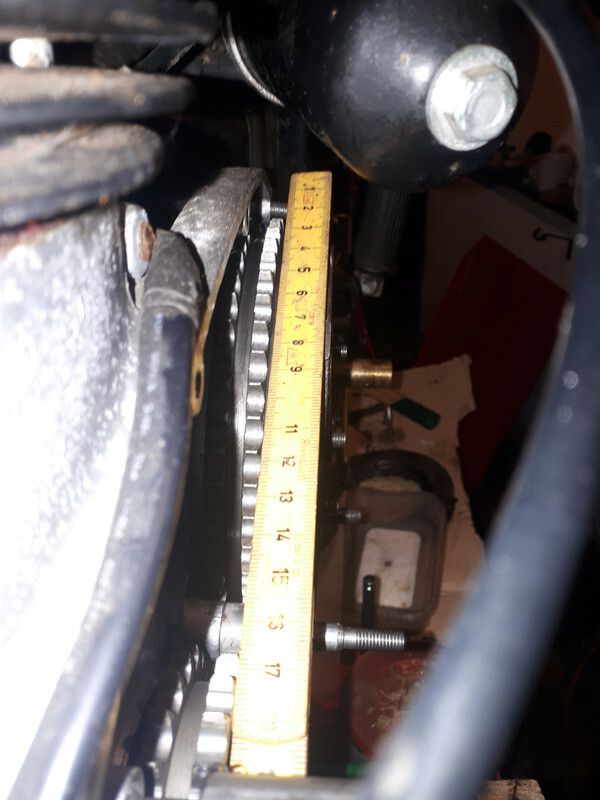 i looks as its the timing pin, but i will do a dry fit and check , i am think i will bring my old clutch plates to work and weld up a locking/counter hold tool for the clutch , making it much easyer to check the allignment , the sprocket and chain does seem to have a "suspicius" wear pattern. if allignment is okay , my guess is that the chain does not like "clutch wobble"
I think Mark is thinking A65, afaik all unit singles were 4 spring clutches. will say tho that i am able to "wobble" the basket to fit the alignment....... but not the solution i had in mind. so the problem is the sprocket and rotor is to far out. 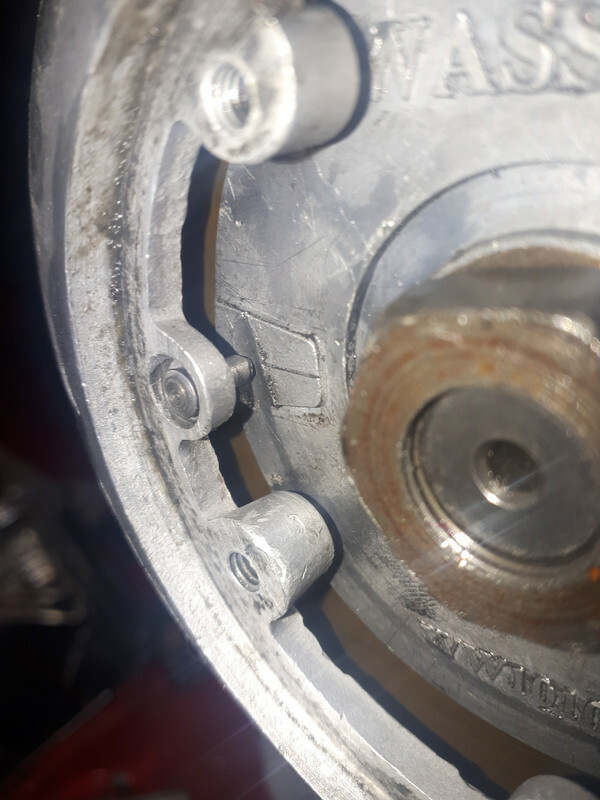 the extra spacer between the sprocket and crank spacer is the likely reason for this..
the problem is that i have run with this arrangement before without any problems. 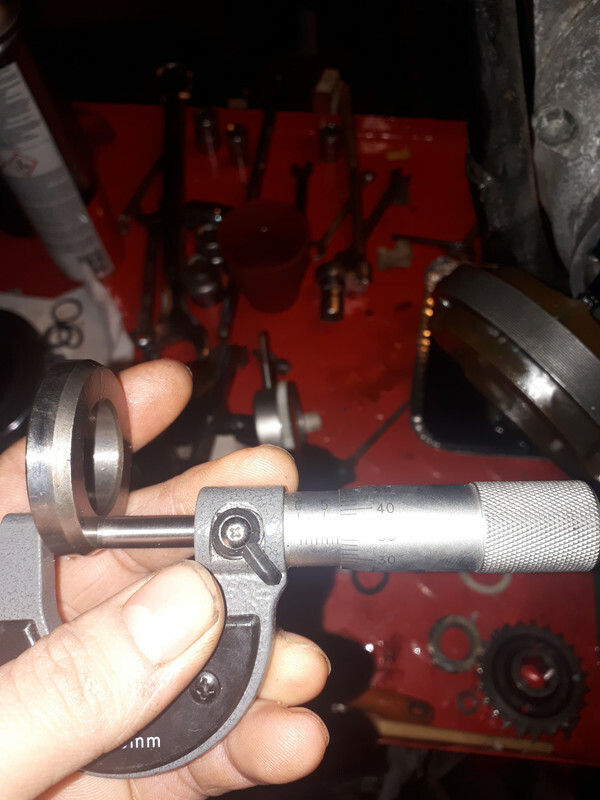 is it possible for the crank to start "floating" out ? i find this very unlikly. but if the timing pin to rotor was very close and the crank floated a thou or 2 this might possible. Possibly the front sprocket is the wrong way round? the timing pin has lost a fair bit. This must have been pretty tight when the case was fitted, was it OK when it was strobed,? that would have caught it ? or somehow the crank has migrated to the primary side ( unlikely if the rotor nut is tight). Last edited by gavin eisler; 02/08/19 10:26 am. Also check the crank for bending. Either the rotor is not true to the crankshaft ( highly likely with a Wassel part ) or the cank is bent. The pin should have cut a groove around the complete circumference of the rotor, not just a short arc. Also check that the rotor is tight on it's centre . The early design had a bad habit of separating between the casting & the centre . In any case that pointer looks way too close to the rotor there should be a good 1/8" between them. What primary cover gasket did you use ? The originals was quite thick. Next, when new there would have been a Lucas rotor fitted so the Wassel was fitted by the previous owner. Please measure the length of the rotor. The military B40 down( B40GA ) here use a narrower rotor & stator , but they were 6V. I think he may have fitted an A65 one to your bike. Rotors come in 3 or 4 lengths as the output increased. Nonsense, the evidence is symmetrical, which would not be the case with a bent crank. I'm sure all the damage was done in a few moments, break the point off, then then rest of it. For whatever reason, the rotor was ~1/8-3/16" closer to the timing pin than it should have been. The point was taken off the pointer on the 1st hitting of the raised timing pad. Thereafter it is just a shortened blunt tool, just able to touch the surface between the high spots. Gavin's idea of the reversed sprocket is quite possible. A reversed sprocket does not change it width . It will only change the chain alignment. ... all the original front sprocket pieces in the same order . were necessary... for the rebuilt-clutchs chain-alignment . Move the duplex-sprocket and rotor outward , closer to the timing pin . With the original front stack of parts ... to cause just enough sideways chain torque ... to cause the contact. Or maybe the contact marks on the rotor have been there all along... and are just now being noticed ? "and the timing pin lines up perfect with the damage to the rotor:"
Yes I see; with the point broken off the pin, it makes a wide gouge. Allan, I replaced clutch discs on a friend's round-barrel B44, and it was a 3-bolt clutch. I had assumed it was original, but maybe it wasn't. 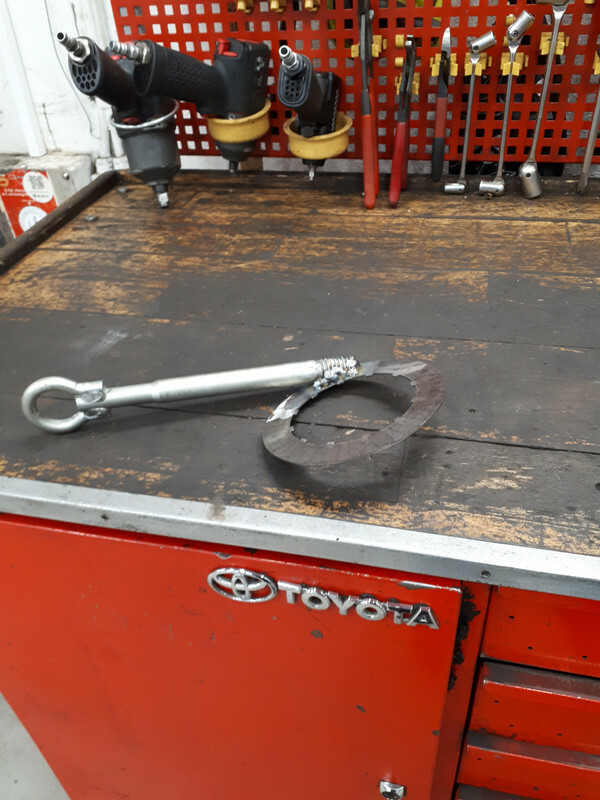 well the only thing i changed that can influence this when i did the clutch plates was the gasket... cant see this alone doing this tho.